The A350 XWB has a structure that is 53% composites. From left to right: Frederic Devenne (Airbus Helicopters), Yvan Arnaudier (Hexcel), Mathieu Bonnafoux (Hexcel), Gerard Chekherdemian (Hexcel), Jobst Queckboerner (Hexcel), Matthias KOENIG (Airbus Helicopters), Frederic Bozek (Hexcel), Guillaume Massé (Airbus Helicopters). 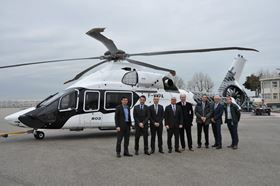 Hexcel Corporation has introduced its third H160 prototype for Airbus Helicopters, featuring a carbon-inspired livery that represents the composite materials Hexcel supplies for the helicopter. This follows Hexcel’s announcement in June that its reinforcements, prepregs, adhesives and honeycomb materials had been selected for the H160’s composite fuselage structures and main rotor blades. The A350 XWB has a structure that is 53% composites and Hexcel supplies the carbon fiber prepreg for all of the aircraft’s composite primary structures.